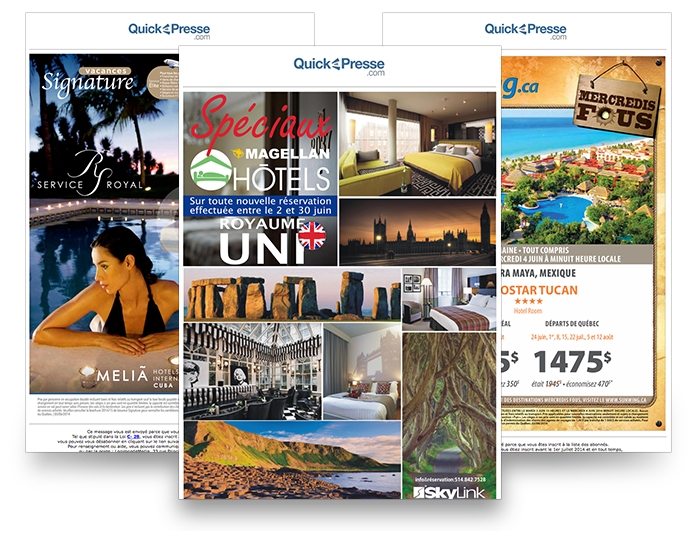 QuickPresse.com an email distribution service for travel suppliers, including wholesalers, airlines and hotels, to quickly and efficiently promote products, services and special offers directly to travel agents. Travel suppliers can rest assured they will be getting the most out of Quick Presse! The service features the largest audited database of Canadian travel industry email addresses in the country, guaranteeing that e-blasts reach the targeted audience of travel industry members. The QuickPresse.com distribution system, along with the PAXGlobalMedia team’s rapid execution, allows e-blasts to be sent within minutes of receiving an order. The system includes a supplier’s entire distribution history for reference purposes. To enable suppliers to customize mailings, all emails are sent showing all company information including company name, brand and one email of their choice. Note that only JPEG & HTML are accepted to in order to achieve seamless downloads of all promotions. Canada’s accounting firm, Deloitte has audited the QuickPresse.com distribution service, making it the only e-distribution system in the Canadian travel trade media industry to offer this added confidence to the product (31,441 unique subscribers). PAXGlobalMedia was the first company to provide an advertisement distribution service by email for the Canadian travel industry (1998). 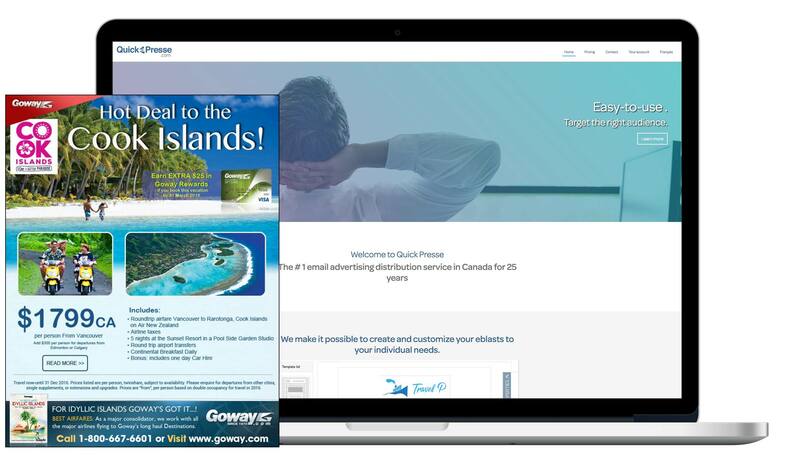 Using national accounting firm, Deloitte, PAXGlobalMedia is the only company in Canada’s travel industry to have audited its distribution lists for three sites and the QuickPresse.com distribution service. PAXGlobalMedia has the largest database of Canadian travel professionals with 26,179 total subscribers. Ten different e-blast templates are now available, which Quick Presse users can fully customize using images, text boxes, unique fonts, and other graphics to get their message just right. Images can be uploaded and stored in the system’s internal library, allowing users to easily access them for future use. The QuickPresse.com distribution system, along with our team’s quick execution, allows all advertisements to be sent within minutes of receiving an order. When travel professionals receive your advertisement in their inbox, it will appear automatically in the viewing panel. Our webmasters have created an online distribution service specifically for QuickPresse.com clients that is available from the comfort of your location and includes your entire distribution history. Quick Presse users now have the ability to upload, manage, and edit their own client lists, to make sure that the intended audience receives the right news at the right time. Rather than simply use an auto-generated list, Quick Presse users can add and remove contacts, depending on which audience they wish to target. For maximum visibility at NO cost to you, each client advertisement is automatically exported for five (5) days to the Quick Presse section on PAXnews.com, PAXnewsWest.com, and PAXnouvelles.com. We have invested considerable resources in the implementation of a sophisticated mailing system to increase the efficiency, speed and frequency of our QuickPresse.com service, using the expertise of a specialized external firm. Statistics reports are also available with the open rate and the click-through rate, providing the information users need to continually improve and focus their next campaigns. Ask about our other specials! Please note that your subject line can only have a maximum of 74 characters and shouldn’t contain characters such as question marks (?) or quotation marks: ‘ ’ . Please note that the PDF format is no longer accepted. Creating an eblast from a web page link is no longer accepted. All images must be on your server, with absolute links directing to your server’s images. Tag (IMG SRC=): address must be in double quotes (“). Simple quote (’) is not supported.